Steamed pudding in its mold. 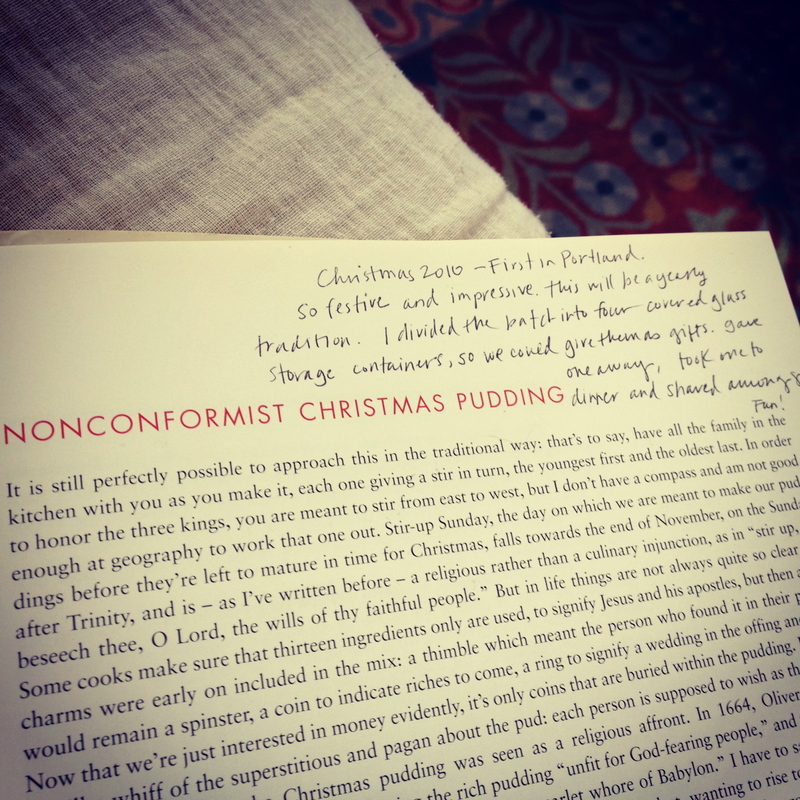 Last year I did start what I hope will become a long-standing tradition: Christmas pudding. The recipe I use comes from Nigella Lawson’s book Feast. 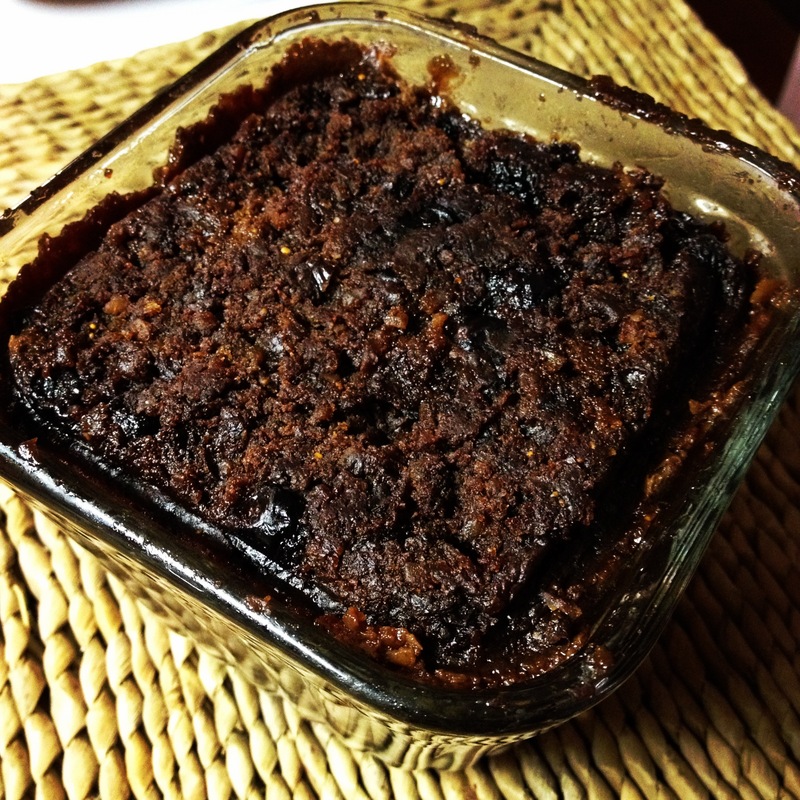 I first tasted “figgy pudding” when a former co-worker brought one to a holiday potluck, and immediately I knew I must try this recipe. Sweet, but not too much so. Dense, sticky and rich with layers of flavor. Is that chocolate? Is it a cake? Is it a fruitcake? And that dollop of rum butter? Oh man. My copy of "Feast." I wrote that this will be a yearly tradition, so it must be so. So the weekend after Thanksgiving, I make the puddings. I follow Nigella’s recipe faithfully, though it could be easily tinkered with. And because I don’t have a traditional pudding-steaming vessel I divide mine into four or five smaller glass containers with covers. The smaller portions make easy gifting and are easily stackable in the refrigerator. I skip the addition of the coins and tokens, which signify good luck, mostly because of laziness. Instead I send our good wishes along to everyone who enjoys the dish. Generously butter the steaming vessel(s) and lids. Grind the figs in a food processor and put them in a saucepan with the blueberries, currants and Kahlua. Bring to a boil and let simmer for 10 minutes. Cut the butter on top of the simmering fruit and put the lid on, leaving it to simmer and melt for another 10 minutes. Put the breadcrumbs, ground almonds, cocoa, flour, baking powder, baking soda and brown sugar into a large bowl. Peel, quarter and core the apples and, as Nigella says, “bung” them in the still-figgy food processor until finely chopped. Add them to the bowl of dry ingredients along with the buttery dried fruit mixture. In the same unwashed food processor, break the eggs and add the sour cream, vanilla and spices. Process to mix and pour into the pudding, scraping the sides to get all the leftover bits. Mix well with a spoon, and pour into the prepared steaming vessels. If you’re using covered glass containers as I do, be sure not to overfill, as the pudding expands as it steams. Makes me smile every time I read it. Put the sugar in the food processor and process to remove any lumps. Add the softened butter and cream it with the sugar. Scrape down the sides, add the ground almonds and process again. With the motor running, add the vanilla and the rum to taste. Taste as you go along. I prefer more rum in my butter, but some might find my preference too strong for their liking. I was treated to a serving of R’s Christmas pudding—and was ready with the fire extinguisher if needed for the flaming vodka. Twas not needed and enjoyed the Christmas pudding immensely. Thank you for all your hard work in bringing and making this tradition (and pudding) for all of us to enjoy. I wish I would have remembered to snap a photo of the pudding on fire, or at least of our plates. I guess I had figgy pudding brain. Glad you enjoyed it, Julia! I sure loved spending Christmas with you this year. It was so much much fun to sit back and watch all this happen. It was a Christmas and Christmas pudding I won’t soon forget. Thanks for making it possible. Yes, remember to put a lid on a flame. Damn, not only did I miss seeing all of you but the pudding sounds fantastic and Lou said it was. We really missed you, Dale. We were thinking of you, and I hope you had a nice time with your folks in AZ!